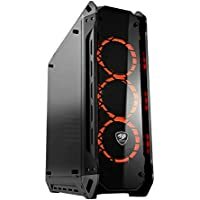 Today only, get Cougar Panzer-G ATX Mid Tower Gaming Computer Case Chassis (Black) + HEC Wall Charger for only $94.99. Tip: Avoid low or no feedback sellers, search and select "Buy It Now" tab and sort by lowest price. You may modify min price to filter accessories to get Cougar Panzer G auctions.